Technology has changed so many aspects of our lives, from the cars that we drive, to securing our home, to how we shop. It stand to reason that while it’s made shopping for the latest fads and fashions much easier (all you have to do is go online now), it also makes things safer and more convenient when it comes to assisted living. 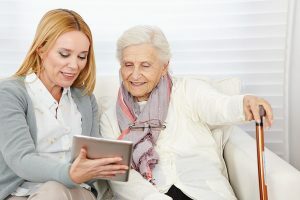 There are so many things that have improved with regard to assisted living and other forms of senior care through the years, and while not all of it is due to the forward march of technological progress, a great deal of it is directly related to it. What are some of the ways that technology has improved assisted living? Communication. The improvement in communication technology has made it so that the seniors within an assisted living facility are able to talk to their loved ones more often. You also have video conferencing features that can be done from the comfort of a laptop whereas this technology was only reserved for large companies or government officials just fifteen to twenty years ago. Health care. Now that doctors have the ability to connect with certain care facilities through databases and easy sharing methods, they can keep track of the patients in their care in a way that wasn’t possible just a few years ago. The ability to monitor blood pressure, glucose levels, and other vital statistics for people living in an assisted living facility have a tremendous impact on over health for the patient. Security. One of the most common concerns that potential residents and their families have when it comes to living in one of these facilities or communities is safety. They want to know that they’re going to be safe within their residence, and thanks to more modern technology, this is easier to maintain and assure each and every resident. Activities. Today, people can travel virtually and learn a host of news things, all from the comfort and convenience of their laptop computers. That provides an incredible amount of activities for seniors to do, whether they are living in assisted living or not. As you can see, technology has made it possible to have a wonderful time, to be safe, and to have the best health care while in assisted living. If you want to learn more about the benefits that technology has bestowed upon assisted living, contact a facility near you. When researching options for assisted living in Galveston, TX, call us at (832) 315-3219. Assisted Living counselors at Serenity Gardens are available to talk with you about your assisted living needs while providing better, affordable care for you or a loved one.